Discussion in 'Parts for sale' started by ToddsGS, Jan 31, 2019. For years the Aftermarket industry was trying to sell us the Wrong Size Gas Pedal for our Buick's. "The Parts Place" has now reproduced the correct size Gas Pedal and they're ONE of the 100's of items that are now available at D C Muscle Cars! Asking $16.00 plus the Shipping Fees. Shipping will be by UPS or USPS and packaged with Care. We've installed 100's if not 1,000's of aftermarket Buick Parts over the years and have a pretty good idea of what's decent and what shouldn't be on the market. 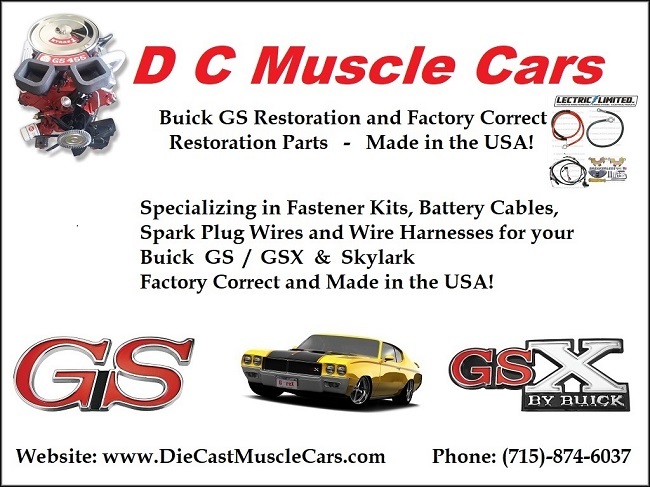 If you're restoring a 1970 - 72 Skylark, GS or GSX and are in need of some parts give me a call. I'll be happy to share my knowledge with these cars. We are Stocking "The Parts Place" Buick Parts now so if you need another outlet for there products give me a call. I may be able to save you some $$$ on the items you need as well! wallypep, meteo7880, rex362 and 2 others like this. How about the little retainer that attaches the throttle cable to the gas pedal? Do you happen to have those? Yes, I do have those little throttle cable retainers in stock.